Lord Brahma, Vishnu and Mahesh created Brahmins who were master in Vedas. So that they can turn Dharmaranya in a centre of veda sanshkriti. The lords asked to Vishwakarma to build houses forts and temples reside for the Brahmins. Brahma, Vishnu and Mahesh created six thousand Brahmins each. They also gave them gotras and gotrasdevi. According to historians the people created by vishnu were sober and honest nature, the people created by Brahma were of rajas nature and people created by Shiva were of angry nature. Brahmin could consented on their work, Brahma created kamdhenu caw and on order of Brahma kamdhenu created 36000 people by digging earth by her nails. Those were known as gobhuja or gobhva. They settled in nearest Modhera so that village known by Gabhu. Brahma gave the responsibility of protection of Dharmaranya to his daughter Shreemata. Modh's are divided in four by caste (1) Modh Brahmin (2) Modh Vanik (3) Modh Patel (4) Modh Modi. Modh Brahmins were further divided into six by caste as chaturvedies, Traividh, Dhanuja, Tandalja, Agiyasana and Jyesthimall. Allouddin Khilji concord Gujarat and looted the temples of Gujarat. When he used to attach the temples, Modh Brahmins faced him very bravely. But they could not defeat Muslims. A treats was under taken that the Brahmins will give 5000 gold coins and the Muslims army will go back. The gate of Modhera was opened and the Muslims did not act according to the treats and attacked on Modhera. They looted the temple of Modhera goddess. Brahmin immersed the idol of goddess in dharma vav to protect it from Muslims and migrated to different places and settled in different places. Some families were went to Morbi from Modhera and settled on the river bank of Machhchhu. In fourteenth century they came to land of Kachchh and settled in different places in Kachchh for business. Since then Brahmins who came from the bank of Machchhu are known as Machchhu Kanthia Modh Brahmins. They have a community hall in Bhuj and Anjar in Kachchh district. There are about 1500 modh Brahmins are settled in Kachchh. Office :- 35, Navnathnagar, Behind S.T.colony, Gotry Road, Baroda-21. For nine days of Navratri Modh Brahmins of bhuj worship goddess singing Arti, Shakraday and Chhandas. They firstly sing Arati of goddess after that they chant sakraday and then the chhandas. It is every day routine for all Nine days. On the eight day they chant four chhandas in the temple of "Bahuchara" goddess. Later it is repeated in the garbi. 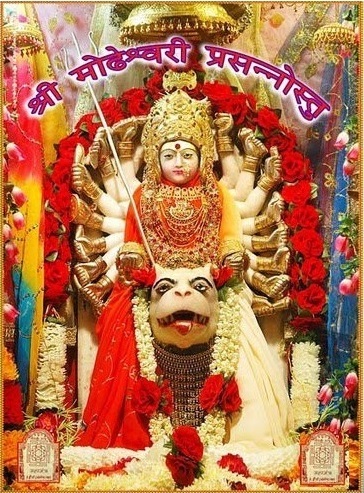 On dashera's day they chant the chhandas and then take pot (garbo) to the temple of Aashapura goddess in Bhuj-Kachchh. There they chant two chhandas and on way back also the chant chhandas. They chant thal in the temple's of Bahuchara goddess. On the day of Sharad Poonam they chant chhandas for load Krishna. They do this for all nine days. They do not play garba or they even do not arrange for any Musical programme. They just stand and chant the chhandas.